This is a real smorgasbord of different vintages. From "Lemon Tree", the B-side of our first single all the way to "Sister Marie", which I think was our last single on Columbia. I'll spare you anecdotes for each and every song, but a couple have stories worth mentioning, I think. "Lemon Tree" was my first outing as an arranger. I unwittingly marked the key changes (there are several) incorrectly. The string and horn players spotted this right away and gleefully played all the wrong notes! The usually imperturbable John Barry lost his cool there for a minute! I tried to accomplish three things with "The Cruel War". Get a hit without Jeremy, who was off acting somewhere, make a statement of some kind about the Vietnam war, and finally, give Jill a job! I failed on all counts, although the song wasn't too bad. I foolishly played it to Peter Yarrow before its release. Peter rushed off and overdubbed some strings on the old Peter, Paul and Mary version and the net result was a self defeating chart battle which both of us lost. What more is there to add about the infamous "Teenage Failure", except to note that it was in fact a failure?! I don't know what Jeremy was playing at and I don't think he knows either. "Sister Marie" was our last single and if it does anything at all, it clearly illustrates the production expertise which comes from a lot of hours in the studio. Curt Boetcher's higher-than- high voice is evident on this track, as is the technical wizardry of Keith Olsen. Jeremy hated all that "ear candy" as it later came to be called, and in retrospect, I can understand how a Moody Blues sort of bloke like I was then would not get along too well with a J. J. Cale kinda guy like Jeremy aspired to be! That conclusion is heavy with irony, because here I am in the year 2000, playing lead guitar in a bluesy rock 'n roll band on weekends! It just goes to show - timing is everything! These tracks are scattered throughout various LPs, singles, and CDs. 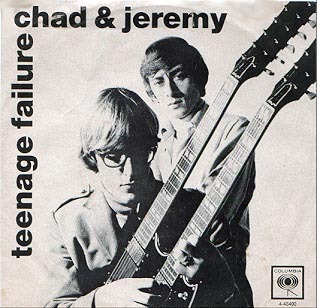 "Lemon Tree" was the b side ot "Yesterday's Gone", and can be found on several CDs, the best being Sing For You/Second Album, released on the Repertoire label in Germany, but the easiest to find being One Way's US The Best of Chad & Jeremy CD. "If I Had My Way", "This Morning, This Evening", "Ain't That Just Like Me", "If I Had A Hammer", and "Stanley and Dora" are (together with a live version of "Yesterday's Gone") on the rare Live Folk at the Mayfair Theatre LP released in the UK in 1964. It was released in its near-entirety (the tracks are oddly faded up and down, and the compere's intros to "If I Had My Way", "Yesterday's Gone", and "Stanley & Dora" were removed) on the Japanese "Sing For You" 2006 mini-LP-sleeve CD, but the vinyl is preferable for being both complete and much less bassy and muddy. "Yesterday's Gone" and "If I Had My Way" are also on El Records' 2005 "A Summer Song" CD. "Early in the Morning" was the b side to "Like I Love You" in the UK, and is on the Repertoire CD, as are "If I Loved You" and "A Very Good Year", hit 1965 singles, and the previously unreleased "The Nearness of You" and "Your Mama's Out of Town". "Pennies", the b side to "I Don't Wanna Lose You Baby", is on Sundazed's Before and After reissue, as is "The Cruel War", the a side to Chad & Jill's only waxing, placed side-by-side with its b side, "I Can't Talk To You". "Sometimes", a March 1965 outtake, the two Italian language tracks, and Jeremy's May '65 "Don't Get Around Much Anymore" are also on this Sundazed release. Jeremy's solo versions of "I Love My Love" and "Anytime" are only on the rare UK single, while C&J's version of "Anytime" was released in 1992 on Painted Dayglow Smile. That's also the place to find a stereo remix of "Last Night". As for "Teenage Failure", you can get it in remixed stereo either with 30 seconds of studio chat, or without. For the one with, go for the Rock Artifacts, Volume Four CD. For the remix without that chat and count in, get Painted Dayglow Smile. Everything on the list from "Anytime" to "You Are She (French)" is also on the Sundazed reissue of Distant Shores, released in 2000. "Cautionary Tale", "Manners Maketh Man", and the single version of "Sister Marie" are all on Sundazed's reissue of Of Cabbages and Kings, while the original pre-dubbing mix of "Sister Marie" is on 1992's Painted Dayglow Smile Columbia/Legacy CD. "Letter To A London Girl" (really just a pre-overdubs "Transatlantic Trauma, 1966") is on Sundazed's 2006 "The Ark" reissue. Copyright 2006 Frank Jason Rhoden.